"Capcom Status Metallic Periphery Sticker" (CAPCOM). Restored by Zona Arcade and Mikonos. "Capcom Status Power Supply Periphery Sticker" (CAPCOM). Restored by Zona Arcade and Mikonos. "Capcom Status 95 Periphery Sticker - 95? ?" (CAPCOM) printed in vinyl with gloss protective lamination (photo 1). "Capcom Status 95 Periphery Sticker - 95? ?" (CAPCOM) printed in vinyl with gloss protective lamination (photo 2). "Capcom Status Power Supply Periphery Sticker" (CAPCOM) printed in vinyl with gloss protective lamination (photo 1). "Capcom Status Power Supply Periphery Sticker" (CAPCOM) printed in vinyl with gloss protective lamination (photo 2). "Capcom Status ????? ? Return Button Metallic Periphery Sticker" (CAPCOM) reproduction printed in metallic vinyl with gloss protective lamination (photo 1). "Capcom Status ????? ? Return Button Metallic Periphery Sticker" (CAPCOM) reproduction printed in metallic vinyl with gloss protective lamination (photo 2). "Capcom Status 94?9? ? Periphery Sticker" (CAPCOM) printed in vinyl with gloss protective lamination (photo 1). "Capcom Status 94?9? ? Periphery Sticker" (CAPCOM) printed in vinyl with gloss protective lamination (photo 2). "Capcom Status Periphery Sticker - 96?3??" (CAPCOM) printed in vinyl with gloss protective lamination (photo 1). "Capcom Status Periphery Sticker - 96?3??" (CAPCOM) printed in vinyl with gloss protective lamination (photo 2). "Capcom Status Periphery Sticker 3: ? ???????" (CAPCOM). Restored by Zona Arcade and Mikonos. "Capcom Status Periphery Sticker 3" (CAPCOM) printed in vinyl with gloss protective lamination (photo 1). "Capcom Status Periphery Sticker 3" (CAPCOM) printed in vinyl with gloss protective lamination (photo 2). "Capcom Status Periphery Sticker 2" (CAPCOM). Restored by Zona Arcade and Mikonos. "Capcom Status Periphery Sticker 2" (CAPCOM) printed in vinyl with gloss protective lamination (photo 1). "Capcom Status Periphery Sticker 2" (CAPCOM) printed in vinyl with gloss protective lamination (photo 2). "Capcom Status Power Supply Periphery Sticker" (CAPCOM) printed in grey metallic vinyl with gloss protective lamination (photo 1). "Capcom Status Power Supply Periphery Sticker" (CAPCOM) printed in grey metallic vinyl with gloss protective lamination (photo 2). 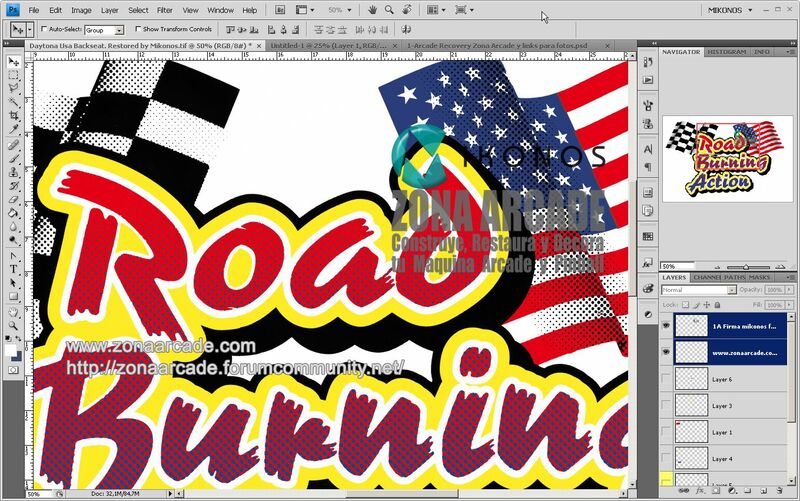 Arcade artwork "Daytona USA Back Seat Decal - Reoad Burning Action". Restored Mikonos. I forgot it and it is a hardwork sometimes: surplus and diecut line (precut line). 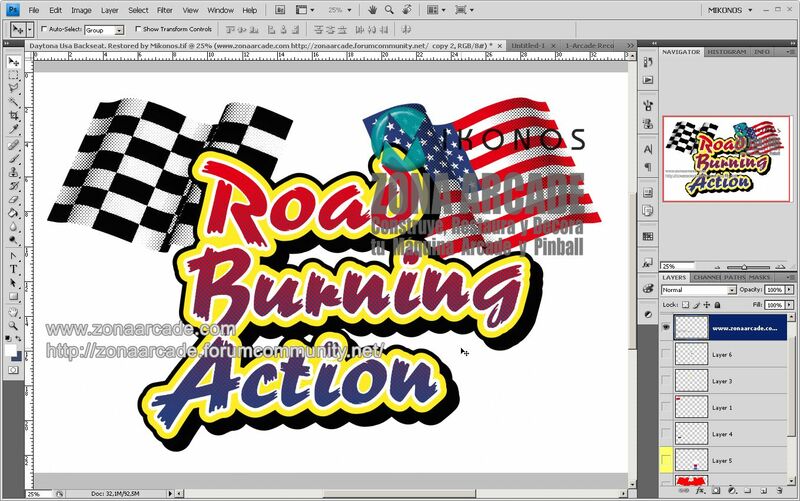 "Daytona Road Burning Action Seat Sticker". Restored Mikonos. "Sky Shark Decal Stickers for Romstar Control Panel Overlay" restored and reproduced by Mikonos. Ready for print! Did you see such a beautiful artwork? 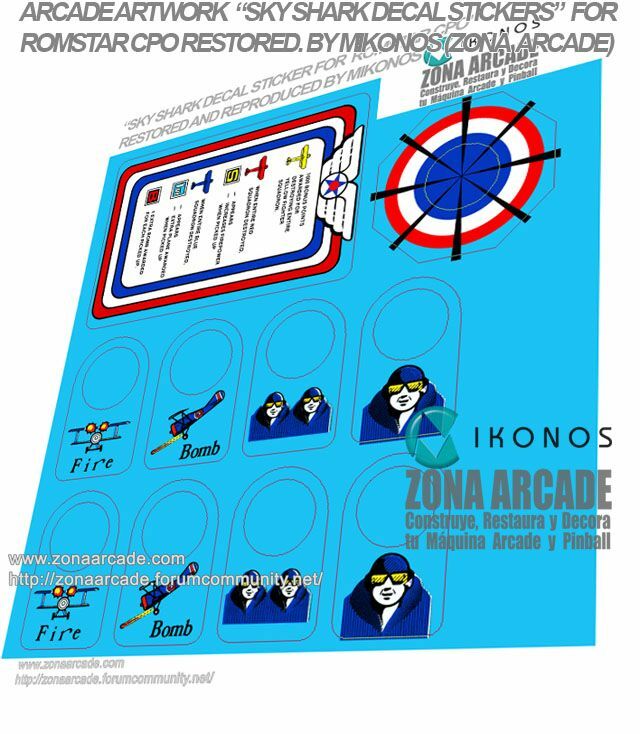 Serigraphy table "Exerion Side Art" acquired by Zona Arcade & Mikonos (photo 1). Serigraphy table "Exerion Side Art" acquired by Zona Arcade & Mikonos (photo 2). This is cool, not seen it anywhere before. Was this used on an Exerion bootleg or something?